The ASZK Annual Awards are open to all members of ASZK. These awards honour the period from 1st January – 31st December, 2018. Submissions are judged by an independent panel of zoo professionals. The awards are announced each year at the Annual Conference Gala Dinner. This award is open for an individual ASZK member whom is currently employed as a zoo keeper. This individual will have displayed outstanding aptitude and dedication at a level that goes well above and beyond expectation in every aspect of their role as a modern day zookeeper. List and document the details of the achievements and/or contribution the individual or team has made. Must be a written nomination with a minimum of 250 words outlining why the individual stands out from all others. 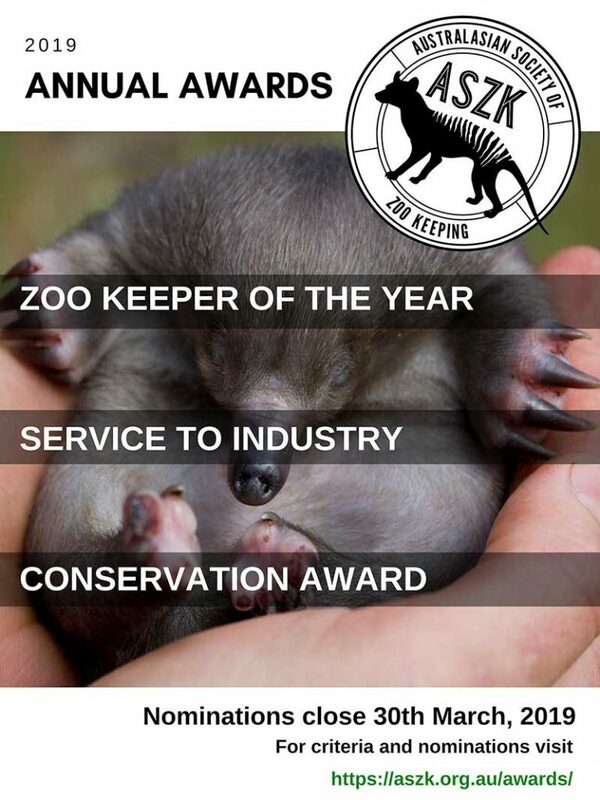 This award acknowledges outstanding achievement in the profession of zoo keeping encompassing the many varied duties expected from modern day keepers. Duties could include, but are not limited to – animal husbandry, training and enrichment, exhibit maintenance, design and construction, animal records, animal presentations, customer service, media, responsibilities, innovation, teamwork and leadership. This award is open to individual members of ASZK or institutions for outstanding achievement in the Zoo industry. This can either be within the past year or for individuals who have contributed to the industry over a long period of time. Examples of achievements include developing husbandry techniques, training, breeding programs, educational programs and facility development. This award is open to individual members of ASZK or institutions for outstanding achievement in the area of conservation. List name, position, institution’s name, address, phone, and the recommendation of a supervisor, peer or colleague. List and document the details of the contribution this person or team has made to conservation. List and documentthe details of the achievements and/or contribution the individual or team has made. This award is named in honour of life member Bruce Kubberre and founder of Featherdale Wildlife Park. Bruce has always been a devoted advocate of keeper presentations throughout ASZK’s history. The Best Paper is awarded annually at the conclusion of the ASZK conference. To submit a nomination please supply all requested information and any additional documents that may support the nomination to slromer@bigpond.com by 30th March 2019. If you are nominating a person other than yourself, please also supply your contact details including phone number and email address.